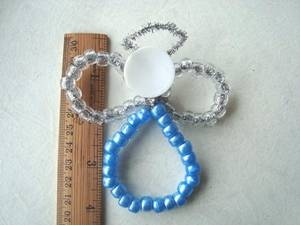 Craft with your kids and make a pretty beaded angel from Emi Harrington! This angel craft for kids is simple and customizable. It'll be easy enough for the kids but fun enough for you! 58 pony beads (34 for the wings, and 24 for the body). 1 shank button or 1 large bead for the head. On one pipe cleaner, thread 34 beads, (this will be for the wings). On the other pipe cleaner, thread 24 beads, (this will be for the body). Form the wings. Bring the two ends of the pipe cleaner together, and twist to close. Pinch to find the center of the string of beads, (or count to find the center), and bring the center to the twisted end. Twist to form a figure “8”. Make the body. Twist the two ends of the pipe cleaner together, leaving one long end. Connect the wings and the body. Using the ends of the pipe cleaner from the wings section, wrap around under the head, and twist together at the back. Make the head: Pass a shank button, or a large bead on the long end of the pipe cleaner, then form a halo with the remaining pipe cleaner.